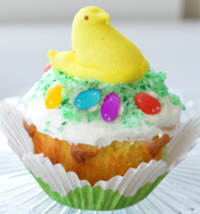 EASTER CUPCAKE FUN FOR THE WHOLE FAMILY! When it comes to cupcakes, the only thing kids love as much as eating them is decorating them! Here are three of our favorite springtime decorating ideas for cupcakes that are as cute as they are delicious. This makes a great boredom-busting spring break activity – suitable for children of all ages. 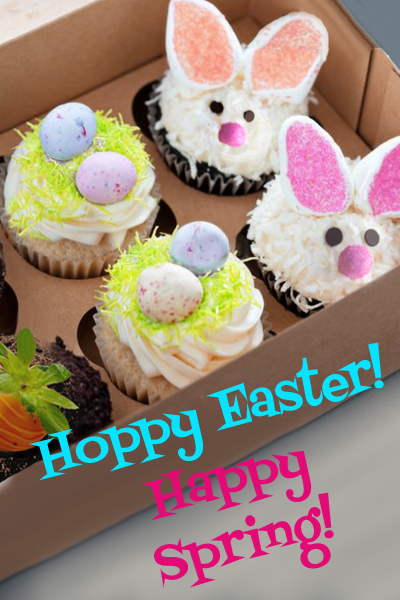 The completed cupcakes also make a charming Easter centerpiece – if they don’t get eaten first! These fuzzy bunny cupcakes are almost too adorable to eat! Kids can make a bunny face with chocolate chip eyes, candy noses, and marshmallow ears! These are easy enough for even the littlest kitchen helpers to make. Substitute jelly beans for the candy eggs to really add a pop of bright color. Place as many eggs (or Peeps) as they like into the nest! Kids always think it’s hysterically funny when they get to eat “dirt”! With this fun decorating project, they’ll be so amused, they won’t even realize that they’re also eating healthy strawberries. 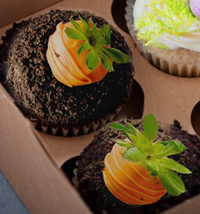 Any flavor of icing can be used – but the “dirt” looks most realistic on fudge frosting. Wash several large strawberries, pat or air dry completely. Leave leaves on! Remove filling from Chocolate Sandwich Cookies. Seal cookies in heavy zip lock bag, and roll with rolling pin until the consistency of coarse “dirt”. Spread on large plate. Heat white chocolate on medium high in the microwave for about 1 minute. Remove, stir and repeat at shorter intervals of 15 to 20 seconds until the chocolate is completely melted. Add a few drops of yellow and a drop or two of red food color to the melted chocolate (to create orange) and stir until it has a smooth consistency, and color is evenly distributed. Kids of any age can push the “carrots” into the cookie-crumb “dirt”, to create a garden for the Easter Bunny!